When it comes to local construction trends, Denver has already become well-known for all the new apartment buildings that have appeared throughout the city. From less expensive, yet still innovative apartment buildings featuring some of the most advanced technologies, to high end, luxurious flats that stand out as some of the most extravagant buildings in the region, Denver can offer you just about everything you can think of. 2017 trends have shown a steady continuation of Denver’s apartment building frenzy, as the influx of jobs in the city have influenced a growing number of people to settle here. Even some Colorado homeowners living outside of Denver have preferred to move to the big city in search of better work. Higher end multi-family unit construction was the main focus in Denver’s construction trends this year. While this tendency is slowing down and predicted to continue its deceleration in the year 2018, industry experts have pointed toward a growing number of millennials who are now opting to move away from rented apartments in the city center and purchase their own properties near the outskirts. These trends are expected to reduce property costs in the next two years and lead to a more balanced market. Also, with the industry being so focused on expensive apartments in the past, a shift to more affordable multi-family units is expected in years to come. All this new construction leads to more employment in the construction industry. 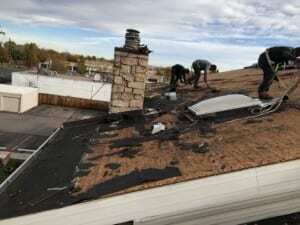 Talented Denver roofer specialists, along with plumbers, electricians, drywallers – all have unique skills needed to supply housing opportunities.